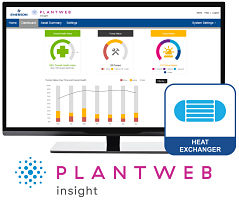 Emerson today announced an extension of its Plantweb digital ecosystem with the new Plantweb Insight Heat Exchanger app, an affordable, easy-to-use analytics and asset alert predictive intelligence tool, which provides maintenance staffs real-time access to critical heat exchanger diagnostics anytime, anywhere to improve operations in chemical, oil and gas and refining operations. Providing quick return on investment through reduced slowdowns and shutdowns, Emerson’s Plantweb Insight apps leverage Emerson’s Pervasive Sensing™ Strategies to help users instantly make sense of plant data and drive overall enterprise profitability. Emerson’s Plantweb Insight Heat Exchanger app joins the previously announced apps for pumps, steam traps and pressure gauges. “The web interface with Plantweb Insight is very intuitive. It is easy to get useful information about our steam traps without requiring a lot of user training. This makes it easy for operators and engineers to benefit from the system.” said Michael Sowell, regional manager of energy distribution, Evonik. The Plantweb Insight apps employ pre-built algorithms based on decades of process experience and industry-vetted analytics to deliver predictive diagnostics, enabling maintenance prioritization. The easy to use interface allows maintenance and operations to take instant action within a browser from any laptop, tablet, smartphone or other device connected to the network. Plantweb Insight monitors shell and tube heat exchangers to provide real-time status and alerts including fouling, heat duty and heat transfer coefficient. It does not require integration with the plant’s existing monitoring and control system. It can operate completely independent of existing or legacy control systems. The app can also leverage existing data points if desired, using OPC UA to collect data stored in the control system, historian or data base if access is available. Plantweb Insight apps paired with wireless instrumentation lower the cost to entry for customers looking to implement an Industrial IoT strategy. Emerson’s Plantweb digital ecosystem is a next-generation Industrial IoT portfolio that extends the power of automation beyond process control to the entire enterprise.